Ideally, many income investors would love to live entirely off dividends during retirement. That’s because a quality portfolio of dividend growth stocks has potential to provide stable income (even during recessions) that rises faster than inflation, thus growing your buying power over time. Best of all, retiring on dividends means your standard of living no longer depends on fickle and volatile stock prices. Instead of selling off shares and drawing down your principle to make ends meet, dividends have you covered. But we don’t live in an ideal world, and generating meaningful dividend income requires a substantial amount of capital. Many investors want to know whether or not their individual portfolios can make them financially independent during retirement. In other words, just how much dividend income do you need to live comfortably during your golden years, and how large of a portfolio is required? That’s a complicated question, but here’s a basic guide that can help you think through some of the biggest factors. How Much Do I Need to Live Comfortably During Retirement? The average household run by someone who is at least 65 years old spends $49,542 per year, according the latest data from the U.S. Bureau of Labor Statistics. Now that’s just an average, and your figure will vary depending on the cost of living in your area (property tax rates, rental rates, the overall cost of living, etc). But for our purposes, that baseline can be a good starting point. Meanwhile, as of December 2018, retired workers and their dependents received an average monthly Social Security benefit of $1,461, or about $17,532 per year. For a couple with the same benefits, that comes out to $35,064 per year, which is below the average household spending of $49,542 per year. In this example, the average retired couple would therefore need to come up with about $14,500 per year in supplemental income to make ends meet. Another popular rule of thumb is that you should plan for Social Security plus investment income (dividends and capital gains) to equal about 80% of your last year’s working income. That’s based on the assumption that when you’re retired you’ll have slightly lower costs for things like clothing and commuting to work. The U.S. Bureau of Labor Statistics data may also be understating long-term retirement costs because thus far relatively few Americans are over the age of 80, when the need for assisted living soars. At some point, it’s estimated that 70% of people will need assisted living of some kind, which can be incredibly expensive. Genworth has a Cost of Care Survey that covers over 400 regions and collects data from more than 15,000 completed surveys. The median amount spent on a private one bedroom assisted living residence was $48,000 per year, and nursing home care had a median cost of more than $89,000 per year. 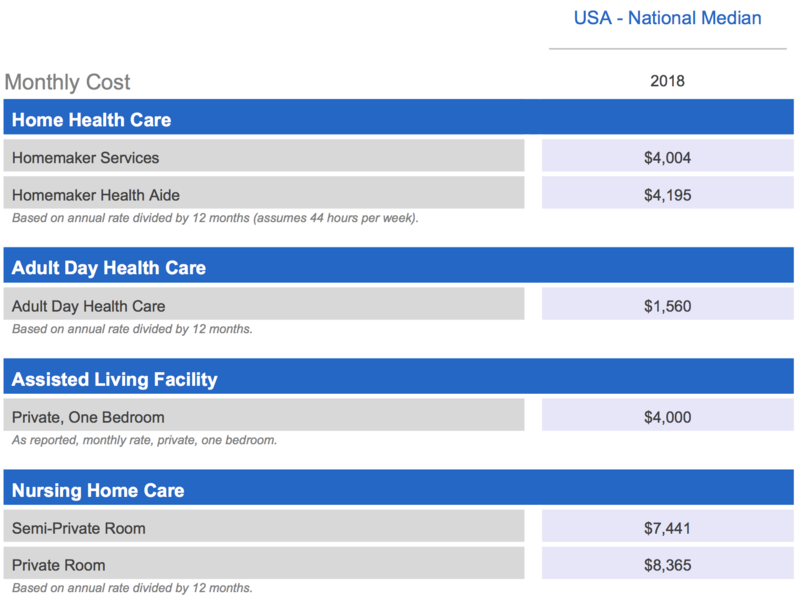 Even home health care services had a median annual price tag of $48,000. What’s more, medical expense inflation is running at about double the rate of overall inflation, a 30-year trend that’s expected to continue. That’s why, according to HealthView Services, a provider of healthcare cost-projection software, the average healthy 65-year-old couple retiring today will likely face $363,946 in lifetime Medicare and supplemental insurance premiums and out-of-pocket medical expenses (in today’s dollars). Merrill Lynch Bank of America puts that figure at $259,000 for a married couple that “wants to have 90% certainty that they can cover their out-of-pocket health-related expenses in retirement.” Healthcare doesn’t come cheap. Simply put, retirement costs are complex. But at a bare minimum the average American couple may need to plan for $14,500 per year in annual income from their portfolio, and preferably far more in the case of health disruptions, longer life expectancies, or even long-term changes to Social Security benefits. But what does that mean in terms of portfolio size and whether dividends can bridge that supplemental income gap? How Big of a Dividend Portfolio Do You Need to Fund a Comfortable Retirement? There are many popular rules of thumb for determining how large of a nest egg you need to fund a comfortable retirement and not risk running out of money. Approximately 39% of people believe the ideal retirement savings amount is between $100,000 and $250,000, according to a 2018 Gobankingrate.com survey of 1,000 Americans. Unfortunately, a nest egg of that size appears insufficient to ensure a comfortable retirement for most folks. Fidelity’s rule of thumb is to have savings (cash, bonds, stocks) equal to at least 10 times your final year’s income, assuming you want to retire at 67. This takes into account out-of-pocket medical expenses during the typical 30-year retirement. The median household income in July 2018 was $62,450 so under Fidelity’s rule of thumb the typical retired couple should start off with savings of $624,500. That may even be too low. A 2017 Merrill Lynch Finances in Retirement Survey estimates the average retired couple needs a nest egg of $738,400. But what are these rules of thumbs and estimates based on? That would be the 4% rule. The 4% rule simply states that if you sell 4% of your portfolio at the start of your retirement, and then adjust that for inflation each year, you’re unlikely to run out of money over a 30-year retirement. The rule is based on a 1994 study by CPA William Bengen who looked at annual market data (stocks and bonds) going back to 1926. Assuming a 60%/40% portfolio of stocks and bonds, this 4% withdrawal rate has become the cornerstone for most retirement savings estimates. While the 4% rule has many limitations it can serve as a rough approximation for determining whether or not you have sufficient retirement savings. For example, the $100,000 to $250,000 “ideal” savings that 39% of Americans seem to believe in would generate just $4,000 to $10,000 in annual income. Remember that using the most recent median retired household spending data we have from the U.S. Bureau of Labor Statistics, a couple needs at least $14,500 per year in supplemental portfolio income to make ends meet. Under the Fidelity and Merrill Lynch estimates the 4% rule would generate $24,980 and $29,536 in annual income, respectively. That’s far above our $14,500 minimum estimate which helps to provide a safety buffer against unexpected medical expenses or higher living costs which so many retirees end up facing. Which brings us to the issue of funding a retirement with dividends, which can theoretically replace the 4% rule. That’s because the 4% rule requires you to sell your income producing assets (stocks and bonds) while a 4% yielding dividend portfolio means you don’t have to sell stocks at all. Since stocks tend to appreciate over time, retiring on dividends can be an appealing choice if you can manage it and understand the risks. But assessing whether or not you can actually achieve this ideal situation, like most things with retirement planning, can get complicated. Talk with a fee-based certified financial planner to work out the best asset allocation plan for your individual needs. But a general rule of thumb for many people is provided by Schwab. As you can see, even most retirees should still maintain exposure to stocks to ensure their nest eggs doesn’t run out, but as you get older many advisers recommend a more conservative asset allocation with a greater emphasis on bonds and cash. Why does asset allocation matter when discussing retiring on dividends rather than following the traditional 4% rule? Why not invest all of your savings in dividend-paying stocks to generate income? For one thing, most people don’t have the stomach to ride out the stock market’s volatility, even if their dividends remain safe during downturns. Owning bonds helps lessen the blow from bear markets, making it easier to stay the course. Historically, the more bonds a portfolio owned, the fewer losses a portfolio experienced. Dividends are technically more discretionary in nature than bond interest as well, resulting in a riskier income profile. However, dividends have historically held up well during recessions, and using metrics like our Dividend Safety Scores can help you build a more sustainable income stream from dividends. But a dividend-focused approach in retirement still comes with an important caveat – your portfolio must be large enough so your dividend yield at retirement is sufficiently high to cover your expenses. As you can see, a large enough dividend portfolio can provide the $14,500+ supplemental income necessary for the average American couple’s comfortable retirement. However, the median retired couple’s portfolio size is insufficient to hit that minimum target, at least with a 4% yield designed to replace the 4% rule. But what about a higher-yielding portfolio? After all, the higher your yield the lower the portfolio size required to achieve your retirement income needs. And today many REITs, MLPs, YieldCos, and other kinds of pass-through investments offer yields of 5% to 10% or even more. At first glance, it appears that even the median retired couple could afford to live off Social Security and dividends if they invest their entire savings in stocks that pay 10% or higher dividend yields. However, this would likely be a disastrous idea because many stocks with such high payouts end up being yield traps, or companies with unsafe dividends that are at higher risk of being cut in the future. It’s true that some stocks, like business development companies and mortgage REITs, do often pay 10% yields, sometimes for many years. But these are financial companies whose payouts are typically variable over the long term with high sensitivity to interest rates and the economy’s health. In other words, a high concentration of double-digit-yielding mortgage REITs and business development companies is a bad idea because most of these end up reducing their dividends during recessions. Some mortgage REITs even do so during bull markets depending on what interest rates are doing. Another matter to consider is that pass-through stocks (anything that’s not a corporation – REITs, BDCs, MLPs, etc.) tend to have different tax treatment than the qualified dividends paid by corporations. See this comprehensive tax guide for all the details, but in general (with the exception of MLPs which have their own unique tax treatment) most pass-through stocks pay non-qualified dividends that are taxed at your top marginal income tax rate rather than the lower long-term capital gains rates. But what about quality pass-through stocks? Can’t dividend investors just own the safest REITs, MLPs, BDCs, and YieldCos? While that is certainly an option and would likely result in a dividend portfolio that yields 6% to 8%, an investor following this approach is still taking on high risk by ignoring the importance of diversification. When building a quality dividend portfolio we prefer not to have more than 25% of our portfolio allocated to any one sector. That’s because any sector can potentially face highly negative effects, such as changes in tax policy or regulations that can potentially disrupt even blue-chip business models. For example, MLPs have been forced by numerous factors (including regulatory changes and a prolonged bear market) to adapt their traditional business models to focus on using lower leverage, maintaining higher distribution coverage ratios, and self-funding their growth projects. For many MLPs, this meant having to cut their payouts significantly. While today the industry’s fundamentals are much improved, the last four years of significant investor losses (and payout cuts) show that you don’t want to rely on any one sector for too much of your retirement income. REITs are another example. While this group of companies has historically delivered solid long-term returns and income growth, this high-yield sector has seen catastrophe in the past. That’s because REITs, like all pass-through stocks, require strong access to debt and equity markets to fund their growth (very little cash flow is leftover after paying dividends thanks to their required high payout ratios). During the financial crisis the REIT sector was very highly leveraged. As credit markets slammed shut, from May 2008 through March 2009 about 30% of all REITs suspended, cut, or switched to paying part of their dividend in company stock, according to The Wall Street Journal. In addition to so many dividend cuts, the REIT sector saw peak losses of 70% during the Great Recession, compared to 57% for the S&P 500. In other words, not just did most REITs fail income investors at their primary job (safe and rising dividends), they also cost them a great amount of sleep during the crisis. Today most REITs use much less financial leverage, which means another Great Recession dividend cut wave is unlikely to repeat. However, the above two examples underscore why investors need to own a diversified portfolio of quality dividend growth stocks and can’t rely too much on just one or two high-yield sectors for their income. 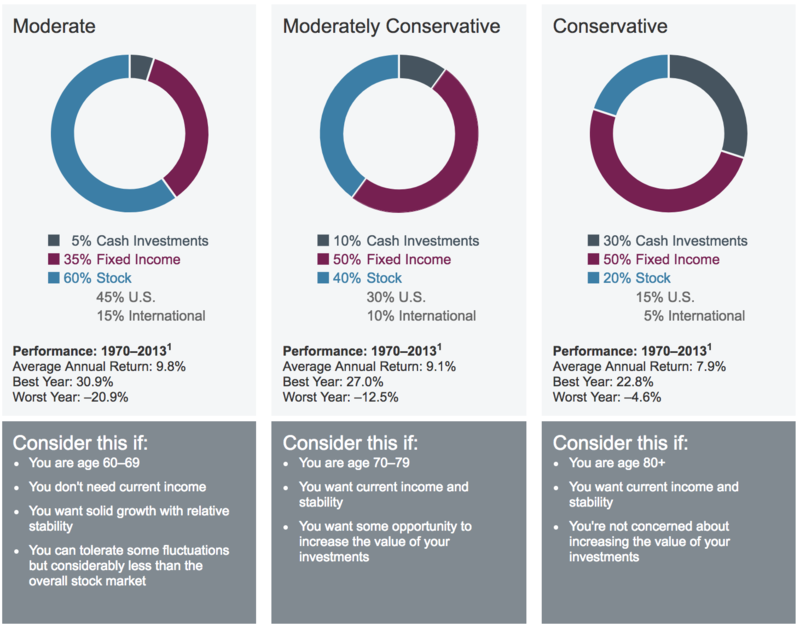 This is why Simply Safe Dividends’ Conservative Retirees portfolio targets a 3.5% to 4.5% dividend yield with 4% to 6% long-term dividend growth (two to three times the rate of inflation). The portfolio also caps its exposure to any single sector at 25% and places heavy emphasis on dividend safety. In order to supply $14,500 per year in dividends, a conservative portfolio that yields 4% to 5% requires a starting size of at least $290,000. If those numbers seem difficult to achieve, you could consider increasing income outside of your portfolio (perhaps a part-time job to explore a new interest), looking for ways to reduce expenses, or perhaps delaying retirement. But teaching for yield is a dangerous game to try and make the numbers work. Retirement could last several decades, and your investment strategy should take a similar long-term outlook that is sustainable. Retirement planning is complicated, so you may consider consulting a certified financial planner to help work out the best overall strategy for your long-term goals. But broadly speaking, while dividends can help bridge the $14,500+ annual income gap many retirees need, they are far from a cure-all for most investors given the upfront savings required. A diversified portfolio of quality dividend growth stocks usually yields no more than 4% to 5% in today’s market environment, which means that most investors still need a sufficiently large portfolio (about $300,000 or more) in order to retire on dividends and Social Security benefits. It may be tempting to turn to higher-yielding sectors and industries such as REITs and BDCs to boost your portfolio’s yield. Just remember that most such sectors have important tax implications to consider and can see sector-wide crashes when their business models are disrupted by infrequent but not impossible events, like the Financial Crisis. Keep those issues in mind if you have the risk tolerance and desire to venture further out on the yield curve with part of your dividend portfolio, and never forget the importance of sound diversification. Simply Safe Dividends does its best to recommend high-quality dividend growth stocks, with strong balance sheets, low-risk payouts, and proven track records of delivering dependable income in all economic, industry, and interest rate environments. However, at the end of the day, while a quality dividend portfolio can be a solid path to a comfortable retirement, it’s up to each individual household to ensure they have a large enough nest egg to generate sufficient supplemental income during their golden years.